A Loop Monitor is used to capture recordings of symptomatic heart rhythm disturbances that happen infrequently. The rhythm disturbances may be suspected because of symptoms but may occur too infrequently to be captured on a standard 24-hour Holter Monitor. 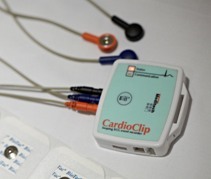 The Loop Monitor continuously samples recordings of the heart rhythm through a ‘looping’ memory so that when an event is triggered by the patient a 1-2 minute sample of recording is stored in the device for later download. The sample includes the heart rhythm prior to activation of the marker button as well as following, allowing direct correlation between symptoms and any change in heart rhythm. The usual period a Loop Monitor is attached is approximately 1 week. The device is smaller than a Holter monitor but it is attached in a similar way.